Eric is working at JurInnov, Ltd so we are no longer accepting new customers. We hope you understand this decision. It has been a pleasure serving you for the past 10 years. Please visit JurInnov for your security consulting needs. Company founder, Eric Vanderburg, publishes the article Implementation to Instruction - Is teaching next on your Horizon? in Certification Magazine. Independent Systems Consulting celebrates its 10 year anniversary. Join us at BW-3 Grill & Pub in Rocky River. Independent Systems Consulting helps sponsor the Computer Crime and Surreptitious Attack Seminar at Remington College, Cleveland-West Campus. Founded in 1997, Independent Systems Consulting has been providing information systems and security consulting services to Cleveland companies, law firms, and local government bodies. The company has a solid foundation and a flexible workforce able to address a variety of IT consulting solutions from training, business analysis, strategic planning, IT architecture, network support, web site hosting/development, and security planning. Our services range from outsourcing your information security projects with our managed security services to supporting your current IT staff by performing firewall management or helpdesk services. We have consultants who specialize in server and network installation and troubleshooting, security consulting, disaster recovery, help desk administration, and more. With our industry certifications and partnerships with vendors like Microsoft, Cisco, Dell, and Smoothwall, we have vendor approved skills and the resources to create a solution for you. Whether it is training, strategy, project management or technology deployment, Independent Systems Consulting has the experience to bring you success. 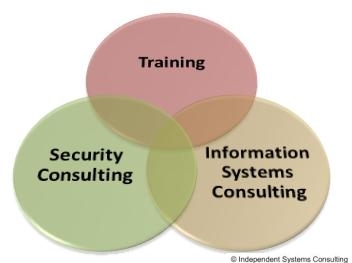 We have three business lines, Security Consulting, Information Systems Consulting, and Training. We call these three business lines our service triad. We pride ourselves in offering a wide variety of services to help your organization reach its defined business goals. See what our clients say about our consulting services. "Independent Systems Consulting is very dedicated, creative, knowledgable, energetic, and professional. They have a lot of drive and motivation. I was especially impressed with their attention to detail and friendly demeanor." Began working with Independent Systems Consulting in 2005. "Independent Systems Consulting helped me secure our environment and gave me good business advice as well. Eric is one of the only true experts I know in the field of network security. He is extremely knowledgable, a great resource and a wonderful consultant." Began working with Independent Systems Consulting in 2003. "Independent Systems Consulting has always been there for me when I need them. They are just a phone call away and that gives me the freedom to concentrate on my business rather than worrying about my information systems." Began working with Independent Systems Consulting in 2000. Copyright © 2002 Independent Systems Consulting All right reserved.